Since my daughter is packing her lunch every day this school year, the two of us are constantly trying to find new ideas for yummy food to pack in her lunch. 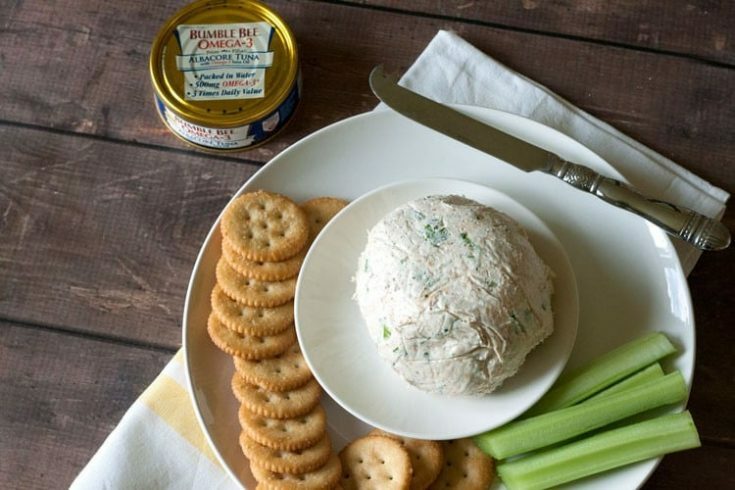 We came up with this super simple Cream Cheese Tuna Dip that is PERFECT with crackers or used in a tortilla with a little bit of cheese for pinwheels. Super yum! Both of these make an excellent school lunch idea, and a break from the PB&J if that’s what you rely on normally. I like to use Bumble Bee® Albacore products for a quick and easy way to make a delicious snack. Not to mention, its a great way to add a variety of nutrients to your diet including lean protein, healthy fat, and important vitamins and minerals. We made this dip up in the evening and I have to admit that we ate a huge portion of it…just enjoying the Cream Cheese Tuna Dip with crackers and celery. It was a delicious snack! Want more great recipe ideas? Follow Bumble Bee® on Twitter and Pinterest for more recipe inspiration. If you love tuna as much as I do, you’ll find a ton of amazing recipe ideas there. I’ll be trying a few of them soon for other school lunch variations, because making sure my daughter has something healthy and delicious to take to school for lunch every day is a top priority. Mix all ingredients together. Form into a ball and chill for a few hours. Serve with crackers or spread on tortillas, roll up, and slice into pinwheels. « The Wilderness Resort in Wisconsin Dells – Summer of Fun!